Counselors are clinicians-in-training, supervised by licensed university faculty. The counselors are students enrolled in programs within the Department of Counseling and Human Services at St. Mary’s. All counselors speak English; some speak Spanish. Play is a natural way for children to learn from and communicate with adults. Research has shown that play is an essential part of child development. Through play, children can learn creativity, self-control, emotional expression and social skills. There are many different therapeutic treatment modalities for children referred to as play therapy that are utilized by family therapists, social workers, counselors and other mental health professionals. All of these methods use play as a way of engaging children in the therapeutic process. Also, because children learn and process experiences through play, play therapy is used to communicate with children and help them with a variety of issues. You can view an informational video about play therapy on YouTube for more information. Neurofeedback training (NFB) is a cutting-edge approach used to treat a wide variety of issues in adults and children, as depression, anxiety, sleep disturbances, Attention-Deficit Hyperactivity Disorder (ADHD) and autism spectrum disorders. 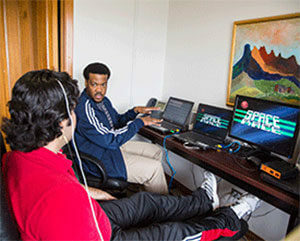 Operating somewhat like a video or computer game, NFB alters the client’s brainwaves by rewarding the client with points, sounds or visual images on the computer screen when “healthy” brainwaves are produced. Research has found NFB to be an effective treatment for many issues, especially when utilized along with psychotherapy. Call for more information to find out if NFB might be a helpful treatment. In order to accommodate the needs of clients with limited resources, the Family Life Center offers high quality services on a sliding scale based on a client’s household income and personal financial situation. Fees are determined when a client’s first therapy session is scheduled. Daytime and evening appointments are available except on university holidays. Schedule an appointment over the phone by calling 210-438-6411, or online by using the form below. Appointments can usually be scheduled within a week, and all session are conducted in the Family Life Center, near St. Mary’s University.